San Luis Obispo’s newest restaurant–and most talked about–is Vegetable Butcher, downtown on Marsh. I have had the pleasure of dining there twice in the past week–once for lunch and again a few days later for dinner. Here’s a few quick hits. all HUGE helpings designed to share. 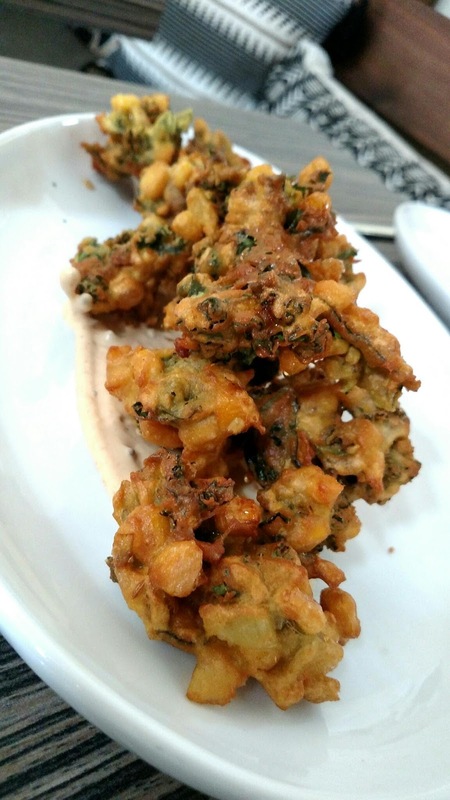 For lunch, our SPRING VEGETABLE FRITO (the official name of “the kale dish”) was bright and fresh and crisp, for dinner it was rubbery and greasy, with a heavy visible glossy surface. First of all, Vegetable Butcher is NOT a vegetarian resty. There are 5 or 6 meat items scattered throughout and noticeable in their absence are dishes comprised of vegetable protein or protein substitutes. I welcome that approach unabashedly. 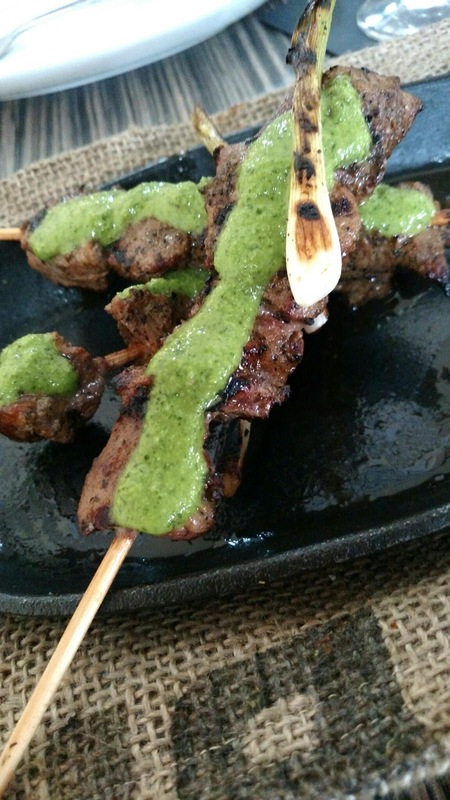 STEAK SKEWERS come juicy and perfectly cooked, probably top sirloin, with a generous coating of chimichurri. Not a terribly exciting dish, by any means–almost like a kids-menu sort of item, but a comfortable aside. 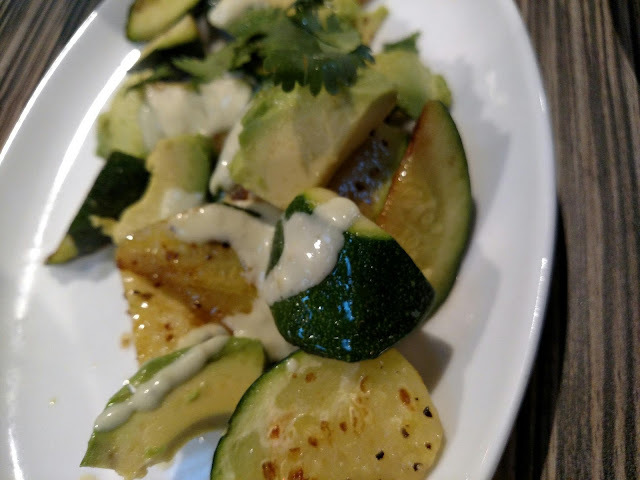 CHAR-GRILLED ZUCCHINI with Avocado–another interesting side–dressed in a lime vinaigrette. Pleasant. Interesting. Simple. THIS was fun! 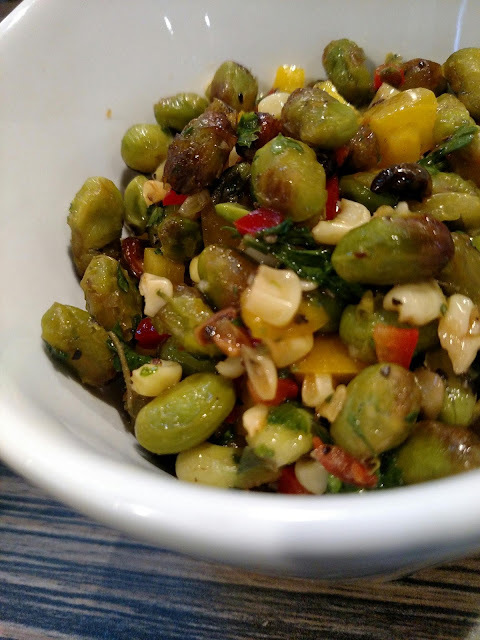 Edamame ROASTED with corn salad and sweet peppers. A very refreshing juxtaposition of flavors compared to the rather monotonous presentation of “sushi” edamame we all are used to. The peppers really popped! A fun FUN way to do green soybeans. 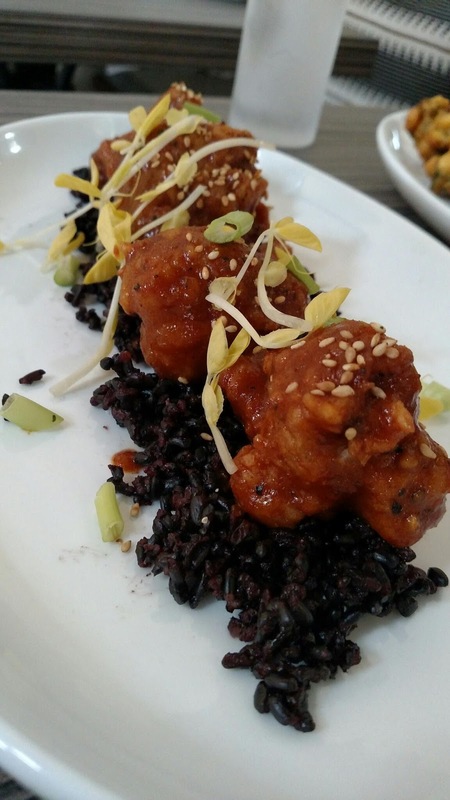 Another one of the signature dishes, mentioned whenever Vegetable Butcher is referenced: the KOREAN FRIED CAULIFLOWER–tried twice, with varying results. My first visit it was fresh and crunchy, with a nice flavor composition to the tangy sauce. The second time is was salty to the point of unbearable. Brand new restaurant, so be patient–they will work the bugs out. 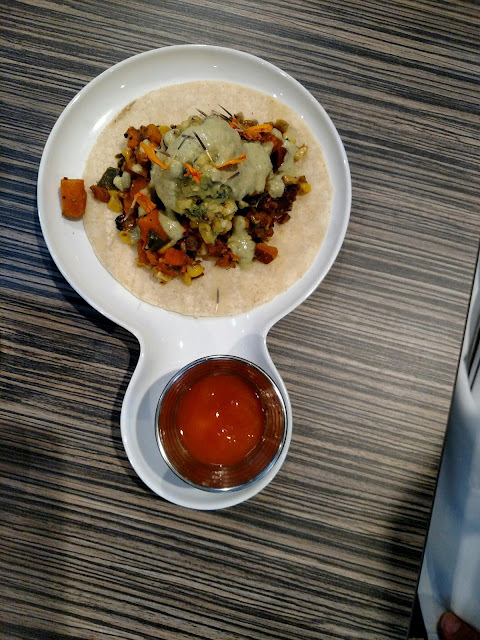 A couple of their half-dozen taco choices.. above, the ROSEMARY SWEET POTATO and CORN; below, another meat dish, the “Tennessee Hot Fried Free Range Chicken”. Not sure how many Tennesseans were harmed in making these, but the meat was nothing short of amazing in texture and flavor. Anxious to try the rib tacos at my next visit. 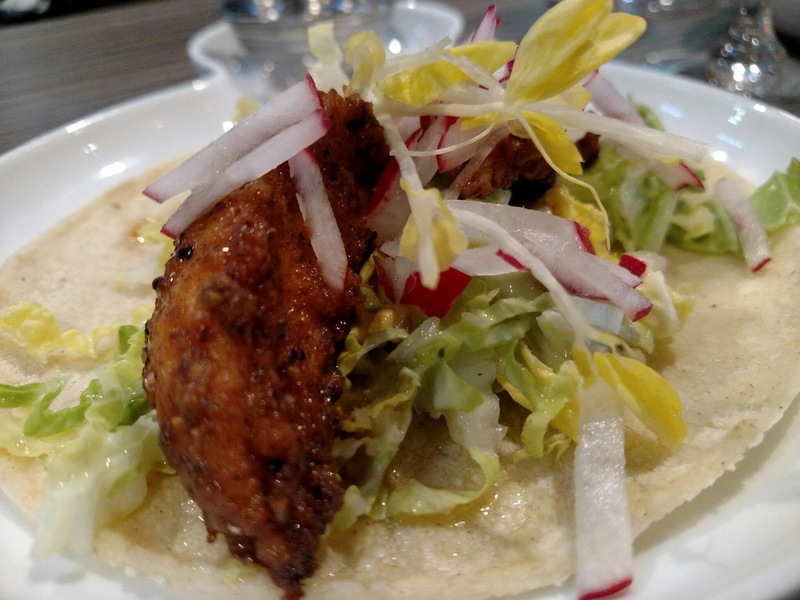 All of these are about twice the price of a street taco, but well worth it. 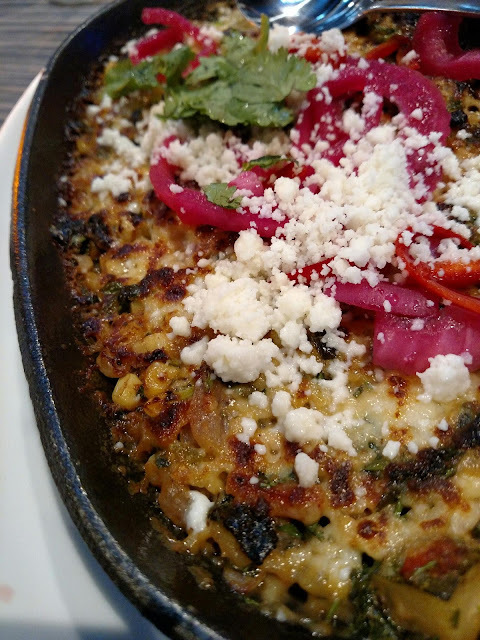 VEGETABLE BUTCHER SKILLET FUNDIDO, another huge portion off the ‘Share’ menu. Served with a pile of blue corn tortillas fried to a flexible al dente, I am not sure the preparation of the tortillas was intentional, but I LOVE tortillas fried this way–a leftover from my restaurant days where these *flaws* would be hastily grabbed up by the staff, as they were improper to serve. Further into the bowl, the tortillas became the more traditional rigid-crisp, so again: not sure which version was intended by the Chef. When this dish first arrived, I somewhat poo-pooed it–as it is something I do not typically order or eat–but found myself scooping and scooping far into the meal, quite enjoying all it had to offer. Quinoa! 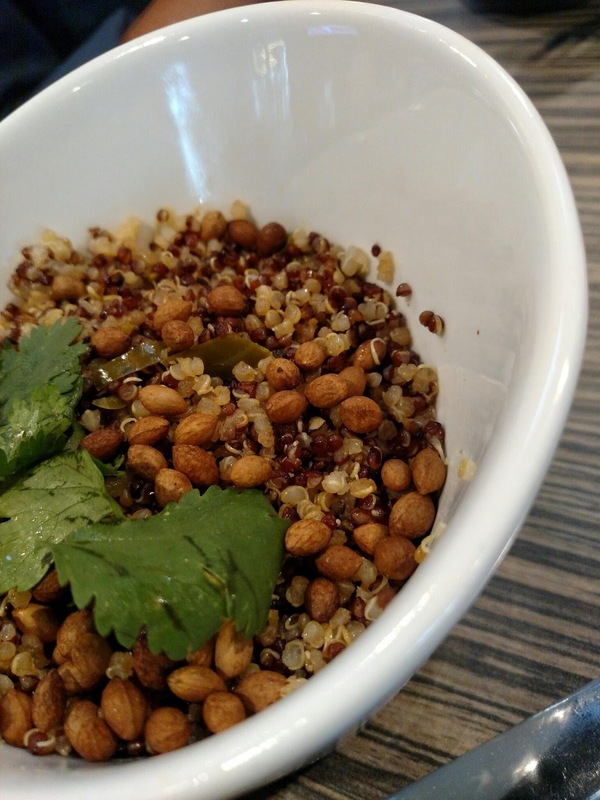 What vegetarian resty would be complete without QUINOA!!! Chili and lime infused. 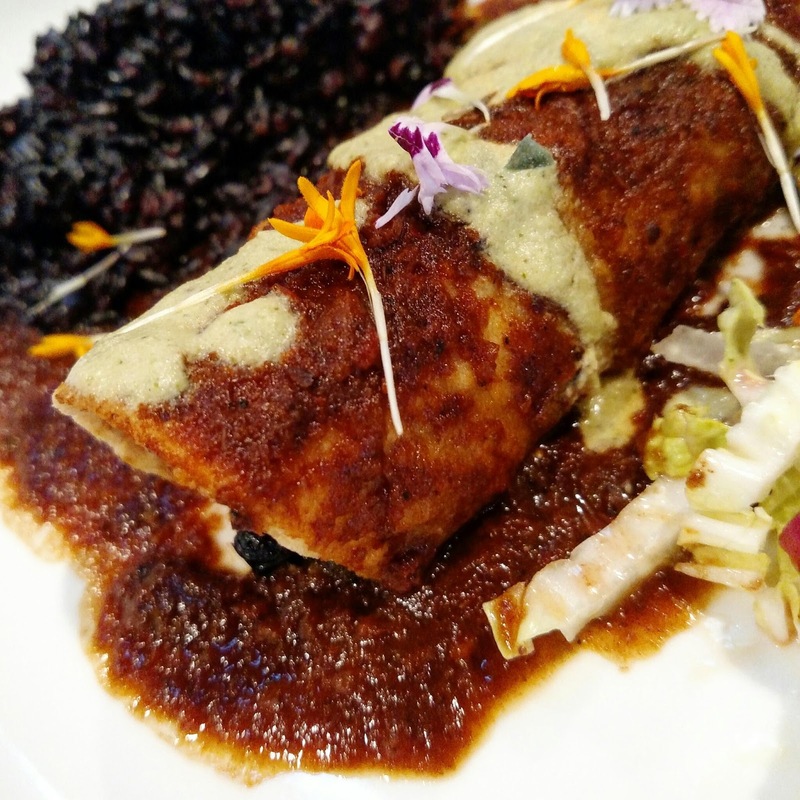 Again, not the most complicated dish on the planet–and certainly nothing to write home about, but unlike anything being served in San Luis Obispo and a perfect accompaniment to the rest of the menu. I don’t even know what a Yulu Seed is, but they’re good! Vegetable Butcher takes their enchiladas very seriously. This appears as a flagship item on the menu and the ingredients change with market availability. The night I visited, it was stuffed with plantain and served with more of their awesome black rice (which shows up on several dishes) and a pile of fennel root. The sauce was a perfect dark-roasted enchilada, showing robust savory against the rotund sweetness of the plantain. This is something you would run into at exclusive vegetarian outposts in Los Angeles or San Francisco. The Chocolate Cake. Ok, so I’m not sure what is going on here. I was dining with restaurant owners and food executives and we were all in a bit of wonderment on this one. 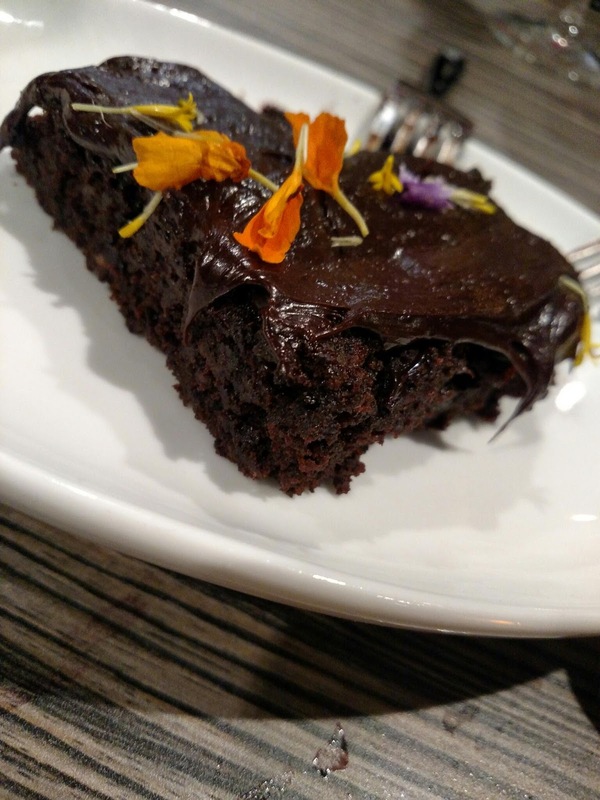 Flavor was nice, texture runny and soft–like a fallen brownie made with applesauce or something. But there were chunks inside none of us could identify. Small round globules of something, like a swollen bulgur wheat or barley or something. Very odd, and while it did not affect the flavor, it was a little *granola* for this crowd. I am really excited about Vegetable Butcher being here in San Luis Obispo. It fills a great void in the dining scene on the central coast. Here-to-fore our only offerings down the vegetarian direction have been heavy-handed ‘hippie’ establishments. It is so nice to dine–plant-based–in a hip, upbeat, beautiful, brand new spot with a decent wine list and dinner hours, surrounded by people who take showers and comb their hair. Oh, yes, there’s a wine-list! Not an amazing list, but a bit of an unusual wine-list for downtown SLO dining, with interesting local offerings mixed in with international curiosities and safe Napa/Sonoma picks. The management’s stated goal is to add a meat and fish entree special each day to the menu for dinner hour. As it is, they are working off their skeleton menu from soft-opening, but it is chock-a-block FULL of must-order’s. I’ve only worked through half of it and already have several other items hard in my sights. Trout Beignets, I’m looking at YOU. Service remains a bit of a problem. Brand new resty–give them time, but I hear complaints from all over–and it is unanimous, whoever I speak to, everything from minor annoyances to full-on, refund-worthy breaches of service–or lack of it. Both of my visits were marred with everything from small eye-rollers to table-silencing faux pas. Figure it out, Vegetable Butcher. I love you, but get it together. 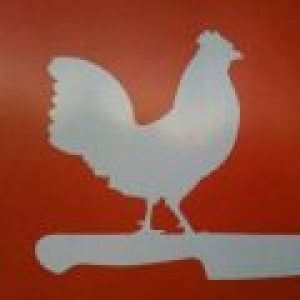 Next Post New Restaurants Blessed!